Although I wasn't expecting to read too much on my trip, I ended up finishing 3 books with all the driving we did. 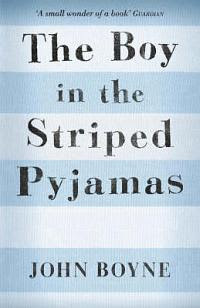 The first was The Boy in the Striped Pyjamas by John Boyne. Varen bought this for me as part of my "gift package" before I left (more on that in my mammoth holiday post). It is Berlin, year 1942. When Bruno returns home from school one day, he discovers that his belongings are being packed in crates. His father has received a promotion and the family must move from their home to a new house far far away, where there is no one to play with and nothing to do. A tall fence running alongside stretches as far as the eye can see and cuts him off from the strange people he can see in the distance. But Bruno longs to be an explorer and decides that there must be more to this desolate new place than meets the eye. While exploring his new environment, he meets another boy whose life and circumstances are very different to his own, and their meeting results in a friendship that has devastating consequences. 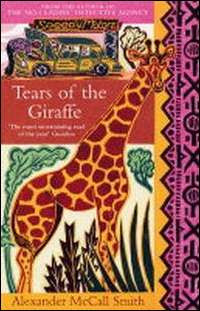 The second was a book I borrowed from one of the girls on the trip, Tears of the Giraffe by Alexander McCall Smith. THE NO.1 LADIES' DETECTIVE AGENCY introduced the world to the one and only Precious Ramotswe - the engaging and sassy owner of Botswana's only detective agency. TEARS OF THE GIRAFFE, McCall Smith's second book, takes us further into this world as we follow Mama Ramotswe into more daring situations ... Among her cases this time are wayward wives, unscrupulous maids, and the challenge to resolve a mother's pain for her son who is long lost on the African plains. Indeed, Mma Ramotswe's own impending marriage to the most gentlemanly of men, Mr J.L.B. Matekoni, the promotion of Mma's secretary to the dizzy heights of Assistant Detective, and the arrival of new members to the Matekoni family, all brew up the most humorous and charmingly entertaining of tales. Clearly a fairly easy read. Quite a pleasant story but, nothin g spectacular. I only really found it interesting because it was set in Botswana. Although I found the way it was written, the actual language, very strange and not especially easy to read. 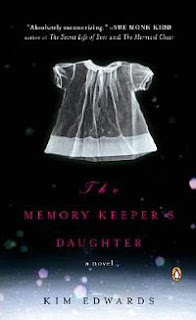 So was the third (but this one belong to a different girl) and was The Memory Keeper's Daughter by Kim Edwards. Dr. David Henry is forced by a blizzard to deliver his own twins. His son is perfectly healthy, but his daughter has Down's syndrome. Rationalizing it as a need to protect his wife, he asks his nurse to take the baby away to an institution. Instead, the nurse disappears into another city to raise the child herself. The book was pretty good, I enjoyed it as a fairly light holiday read - nothing especially dark & twisty here. But a nice enough story with the obvious hollywood ending none the less.